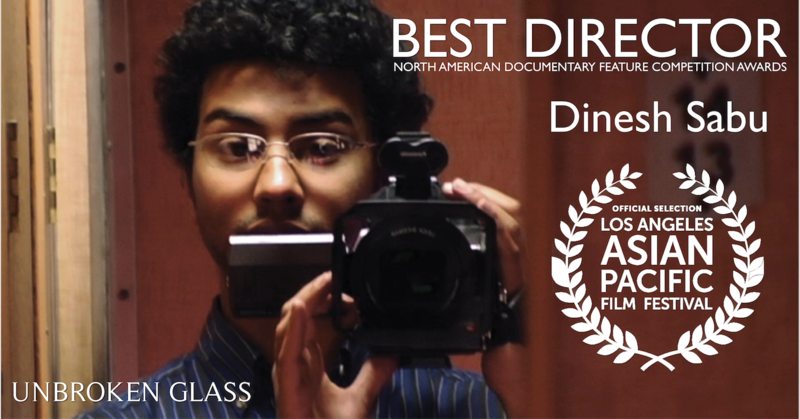 Unbroken Glass director Dinesh Sabu won Best Director in the North American Documentary Feature Competition Awards at the Los Angeles Asian Pacific Film Festival. The award caps off the film's fantastic festival run, and Unbroken Glass continues to play across the country at community organizations and universities. Since the film's world premiere last October, Dinesh has attended every public screening of the film and engaged in discussions surrounding mental health, trauma and grief with individuals and community groups across the country. "I think we have an impoverished sense of what grief and catharsis actually are. We want to “get better.” We feel somehow entitled to get better, to regain a sense of life before trauma. But that was not my experience. Grief was not “getting over it” or “moving on.” It started in painful admission, and proceeded as an evolution of self." Unbroken Glass is available for pre-order on DVD for the discounted price of $19.99 HERE.